On Thursday, February 16, World’s Strongest Violinist Evan Pittman attended “Meet Your Representative Day” at the Arizona state capitol building in downtown Phoenix. Evan joined more than 20 other commissioners for a full day in the Arizona Senate, beginning with a State Senate hearing on education, and including lunch with Arizona District 28 State Senator Kate Brophy McGee. During the lunch, Evan asked the senator multiple questions on her positions on education, and her opinions on incoming Secretary of Education Betsy DeVos. “Meet Your Representative Day” concluded with the students sitting through a Senate session and visiting the Arizona capitol museum. 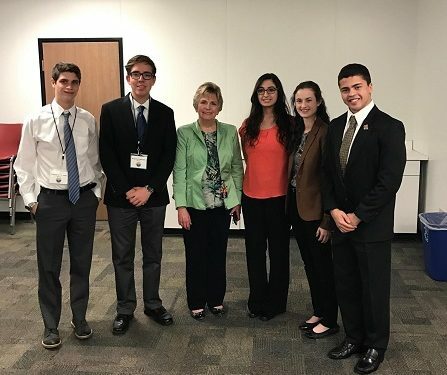 Established in 1989, the Arizona Governor’s Youth Commission (GYC) is a diverse body of Arizona’s high school students composed of members from all across the state. The purpose of the GYC is to engage youth through innovative programs, events and campaigns that effectively serve their communities in areas that are most meaningful to them. © Hal Pittman. All Right Reserved. Site created by McNary Marketing & Design LLC.